"Well, us, or one those Ghostbuster cosplay groups." "They don’t return my calls." The above was a joke that cut from the original script for this comic. I decided I wanted that pause between Ellen and Nanase in panel five, so there was no longer room for it. I like the final version better and it has the benefit of being less referential, but I do like the idea of Charlotte calling Ghostbuster cosplayers for help. 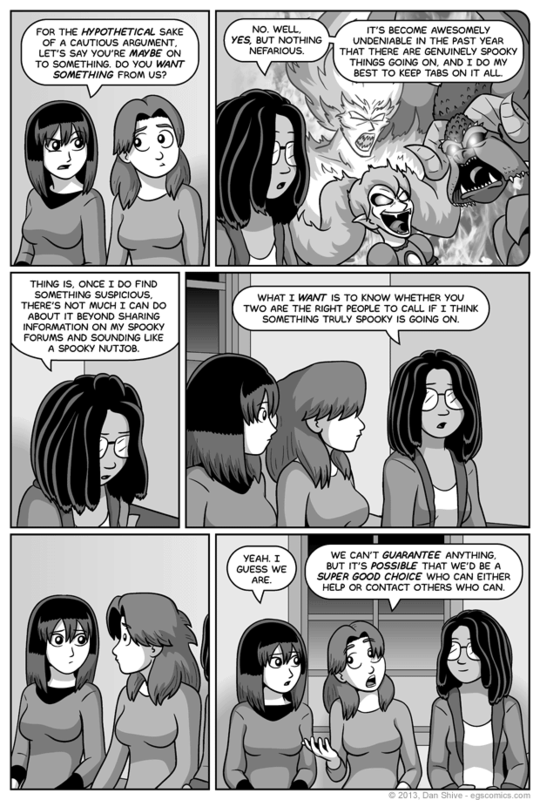 In retrospect, Cheerleadra could have also been included in panel two of this comic. That panel was already preeeeetty crowded, however, and it's better fitting in context to focus on the more spooky, er, spooky stuff.